Major East Coast Storm Detected! 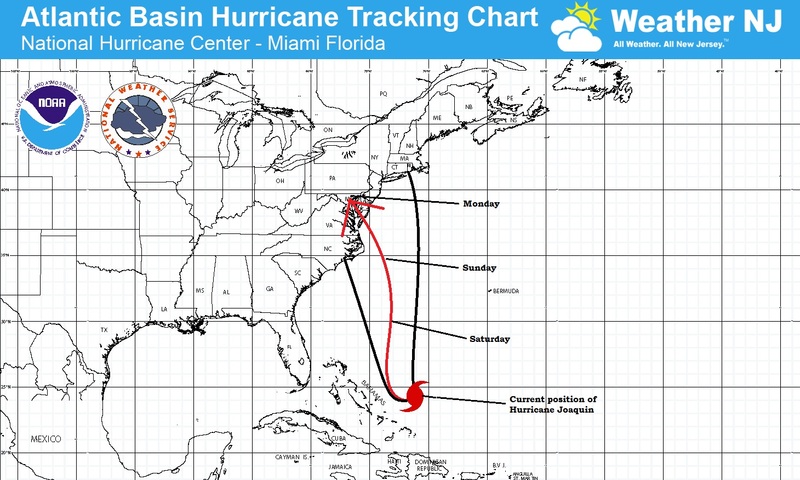 Track: After heading towards the Bahamas over the next 24 hours or so, there is no doubt that most models are steering Joaquin into North Carolina first before essentially drifting through PA and NJ. My cone of uncertainty lies between North Carolina and the tip of Long Island. The red track is simply splitting the uprights for now and you should expect this track to vary/tweak as we further approach the weekend. My guess is that the track might slip a little further south and west but for now, this map represents my thoughts on track. PLEASE KEEP IN MIND that the entire northern/eastern side of the storm’s actual track will likely see the worst onshore flow which should lead to heavy rain, high winds and coastal flooding for multiple tidal cycles. Don’t let your guard down if the track does trend more towards North Carolina than the Delmarva area. We would still be on the hook for all stated possible impacts and that would likely extend into New England. Timing: Joaquin is going to take its time organizing as it drifts towards the Bahamas before making the turn northwards. I imagine areas normally prone to tidal flooding (barrier islands) will start seeing water in the streets as early as Friday/Saturday. The worst tidal flooding should then occur between Sunday and Tuesday for New Jersey given the expected rainfall on top of the storm surge flooding. Therefore, the meat and potatoes of the storm’s impact currently looks like Sunday-Tuesday for New Jersey. Obviously coastal regions will see much higher impact than interior regions and elevations of NNJ. Intensity: This is the greatest area of uncertainty. If you put a gun to my head right now, I’d go with anything from a strong tropical storm to a category 1 hurricane by the time it gets close to New Jersey in the ~Sunday PM/Monday AM time-frame. Synoptic Discussion: We have a trough/upper level low that should phase with and capture Joaquine (just like Sandy but with stronger high pressure blocking to the north/northwest). Joaquin will be moving through a low shear environment over the next few days which should allow it to intensify further than its current 967mb reading from flight recon. We could be looking at another tropical cyclone-to-extratropical transition as it nears New Jersey. This is too hard to call. Sandy made the transition just hours before making landfall. Joaquin will likely make landfall as a hurricane if North Carolina ends up being the point of landfall. If New Jersey ends up being the landfall spot then the extratropical transition is more likely but this will be an 11th hour call. An extratropical transition would mean a larger wind field capable of generating a large area of coastal flooding. A tropical landfall would mean a tighter wind field with greater destructive winds around it’s eye. I simply won’t be able to speak to this in more detail until the storm has made the turn northward and is heading towards the mid-Atlantic. Basically, expect possible extreme disruption from a major east coast storm in the Sunday-Tuesday window of time. Expect high tides to start showing their ugly face as early as Friday-Saturday. Impacts could include heavy rainfall easily measured in inches (I’ve seen anything from 3-10), high winds easily gusting to 60+mph, and multiple tidal cycles of coastal flooding between Friday and possibly Tuesday. Again, look for a shift in model guidance to the south and west which wouldn’t have as much of a weakening factor for us as you would think.